Let’s begin with a statement from the MLB Players Association on February 6. Six of the top 10 free agents were still without homes. Why? Most teams didn’t want to sign 30-year-old players to multiyear deals. Most teams didn’t want to pay a luxury tax. Some teams are saving money for next year’s loaded free-agent class. 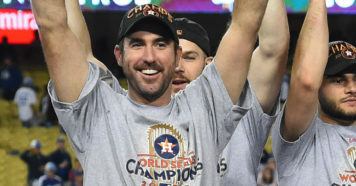 Both the Cubs and Astros spent multiple seasons this decade putting an inferior product on the field, then won a World Series when their prospects improved and their acquisitions flourished. It worked for them, so why wouldn’t every mediocre team do the same thing? Turner added another argument against tanking on the latest episode of Baseball Stories. Makes sense, right? It’s harder to beat four teams trying to win your division, Turner argues, than it is to beat two teams trying to win your division. It seems obvious. But while winning your division is great, you don’t have to do it to make the playoffs. 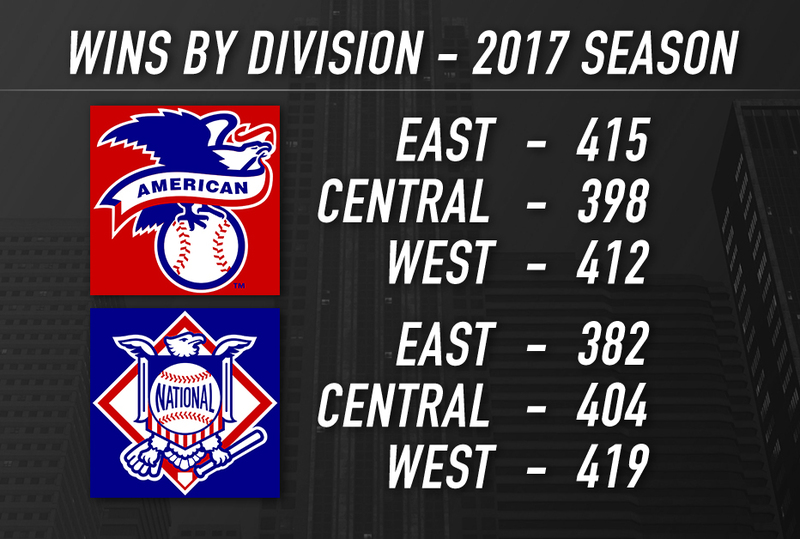 And since MLB added a second wild card team in each league before the 2012 season, it became even less important to win your division. You just need to win a lot of games. That brings in an important conversation: strength of schedule. If a competitive team gets to play a tanking team in their division 19 times, does that increase their chances of making the playoffs? If so, how much? What if a division has, heaven forbid, two tanking teams? How much does strength of schedule really matter in MLB? When you rank teams by strength of schedule — the average winning percentage of their opponents — you don’t see many surprises. We used 2017 as our example, when teams like the Indians had low SOS and teams like the Orioles had high SOS. If .500 is an average strength of schedule, we know that anything below .500 is an easier schedule and anything above it is tougher. Then we tallied each team’s total WAR (hitters and pitchers combined). When you add total WAR to the default replacement level (47.667), you get a win total that represents how many games a team should have won based on their overall production (a similar exercise to Bill James’ Pythagorean expectation). 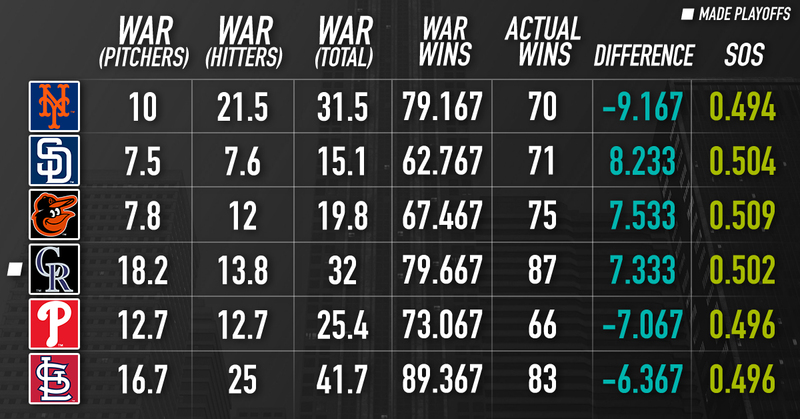 After that, we calculated the difference between each team’s “WAR wins” and their actual number of wins. Now, the fun part: Do the disparities reflect teams’ strength of schedule, or not? Short answer: They do not. Long answer: There’s some really interesting stuff here! 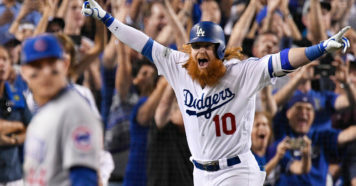 First, not to be rude, but Justin Turner’s Dodgers had one of the easiest schedules in baseball, despite their entire division vying for a playoff spot. There are a couple reasons for that. The Dodgers played the pitiful AL Central as their interleague partner. Also, the Dodgers didn’t have to play the Dodgers. That helps. But this confirms a strange truth that playing in a competitive division doesn’t necessarily mean your schedule is tougher. In fact, only a few teams’ win disparities actually mimicked the strength of their schedule. Teams like the Yankees, Tigers, Giants, Reds and Rays lost several more games than their WAR would suggest, and they also had difficult schedules (.504 opponents’ win percentage or higher). But look at this. Six other teams won or lost six or more games differently than their WAR would suggest, but in the opposite direction of their strength of schedule. The Orioles had the most difficult schedule in baseball last season but won seven more games than they probably should have. There’s something else we should look for in this experiment. Of the teams who were on the playoff bubble, did strength of schedule influence whether or not they ultimately made the playoffs? Long answer: Probably not! There are a couple of indicators in each direction, but no pattern suggests that’s the case. Look at the Rays who, in a vacuum, look like their schedule screwed them out of a playoff spot. Their .506 opponents’ win percentage was among the toughest in baseball, and they lost about five games more than their team WAR would suggest. They finished with five fewer wins than the Twins, who earned the AL’s last playoff spot. But look at the Cardinals, who underperformed despite having a pretty easy schedule. And there are the Rockies, the playoff team with the lowest WAR, who actually had a schedule with above average difficulty (.502). There are factors that haven’t been taken into account here, like managerial decisions and luck. But the numbers seem to show that tanking didn’t have much of an influence on which teams made the playoffs last season. Another useful, if not obvious, piece of information: Wins are not distributed evenly among divisions. Every team in the NL West competed for a playoff spot last season (if you call what the Giants did “competing”), but that didn’t mean they pushed each other out of playoff contention. Instead, the NL West won more games than any other division. If teams only played opponents from their own division, tanking would be an enormous problem. Teams may play division opponents 19 times, but that’s 19 of 162. The disparity in strength of schedule is minimal in baseball. There’s another line that tends to come up when MLB players complain about tanking, and it was part of Justin Turner’s explanation on Baseball Stories. Now, we forgive Turner and other players for feeling this way, but there’s something the baseball world needs to get straight. Teams who tank aren’t trying to lose; they’re trying to win! The Astros hadn’t been to the playoffs in six seasons before Jeff Luhnow came to Houston to tear their roster apart. It had been three straight years without a postseason in Chicago (and 104 years without a World Series) before Theo Epstein took over the Cubs. Before those executives took over, the Astros and Cubs weren’t tanking. They were just bad. But it took both teams four seasons and they were back in the playoffs. In Theo’s fifth season, the Cubs won a World Series. 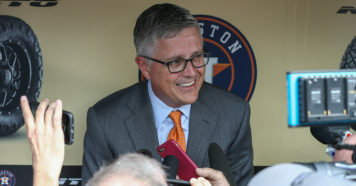 In Luhnow’s sixth, the Astros did. And that’s why tanking can actually be good for baseball. Teams aren’t going to go 100 years without winning a championship anymore. If a roster isn’t good enough to make the playoffs, front offices have a proven method to fix it. We all just have to be a little patient.